Left, Charles at age 84 is holding Alfred Franklin Harrell 3rd, his great grandson, shot March 2, 1952. Franklin remembers visiting his great grandfather in the late 1950s, his most vivid recollection is of that large, gray, bristly, scratchy mustache. Photo on right shot around 1920. He was listed in 1870 census in Hunter's Mill TWP, Gates Co., NC as 1 year old. Listed in 1880 census in Holly Grove TWP, Gates Co., NC as 10 years old. Resident of Surry County when married in 1893, and in 1894, with son born, described his occupation as farmer. Estelle Harrell Pierce said that he tried farming but could not make a go of it. By 1900 he had partnered with his father-in-law, Joseph Etheridge as a fisherman in Sleepy Hole, Nancemond Co., Va.
With the death of Joseph Etheridge in 1908, Charles became sole owner of his fishing venture. A portion of the fishing business was divided between the heirs of Joseph Etheridge, but Charles continued as an independent Virginia River fisherman. Between 1900 and 1906, Charles had built a home near the Nancemond River at Drivers, Nanemond Co., Va. By 1920, his home was free of mortgage. C.T. Harrell has movies made by relatives of Charles on a family fish outing. He was called Captain Charlie by many of his grand children. Ben Pierce related to C.T. Harrell, how Captain Charlie sent a barrel of river eels to New York City as part of his business. Additionally, Charles was a very religious man with great faith in God. 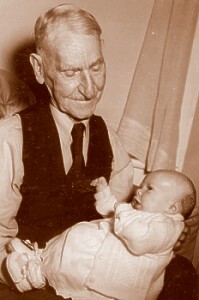 During his last days, Charles was nursed by his daughter Mabel Harrell Watson. Mabel explained that during those last days, Charles was breathing very heavy and suddenly, just stopped. His will was found in Nancemond Co., Va.